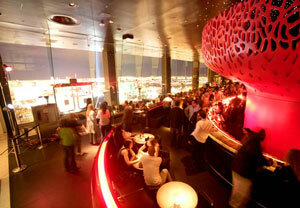 Mix Nightclub and Restaurant is seated 64 floors up on the top floor of Mandalay Bay's THE HOTEL. Mix is both a classy restaurant and upscale nightclub all in one space. The restaurant is white in décor and serves French food created by world class chefs. The black and red colors in the nightclub set the tone for style and sophistication for the discriminating client. There are two separate elevators that bring guests up to Mix. The restaurant elevators are located in the same area as the elevators that take guests up to their rooms at THE HOTEL. Upon getting off the restaurant elevators and entering the restaurant your senses are overwhelmed by the stunning white décor of the dining room. There are thousands of hand blown glass balls that are strung from the ceiling high above and nearly reach the ground. This art fixture is said to have cost nearly one million dollars to build. There is a private staircase that leads guests dining in the restaurant up to an area that overlooks the entire venue. Tables with plush white leather seats are throughout the main dining room. There are comfortable white booths that line the walls and have gorgeous views of Las Vegas. The wine cellar at Mix is one of the largest in Las Vegas and the Sommelier of Mix will be sure to help you chose the right wine selection that is right for you. The kitchen is an open air kitchen that allows guest to see their meals being prepared before consumption. Across from the kitchen is a private dining area that seats up to 20 people. This private area is typically used for larger groups and for chef's tasting menus that are presented personally by the chef himself. There is an outside patio with booth seating and strip views for a romantic dinner as well. Mix Nightclub is connected to the restaurant and takes on a completely different theme. As you enter through the restaurant the long black leather seats give patrons the best view in the entire city. 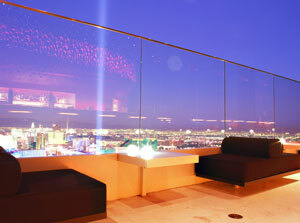 Mix is situated on top 64 floors up with a view down the strip from Mandalay Bay all the way to the Stratosphere. The floor to ceiling glass allows people a perfect view of the neon lights stretched across the desert. There are outside booth seats with strip views as well and gives clubbers and open air experience. The view of the Mandalay Bay sign is just a glimpse away. There is an open dance floor with club lighting for you to groove the night away on. The DJ booth is set right behind the dance floor spinning the hottest dance tracks of yesterday and today. Even the restrooms have a glass window with a view! There is a private area located on top of the bar that is utilized for corporate events or larger groups. Mix boasts the best view Las Vegas has to offer and is a great spot for people who don't want the hassles of a mega club.